Theater visionary Judith Malina has died. A mentor, collaborator, and friend. R.I.P. 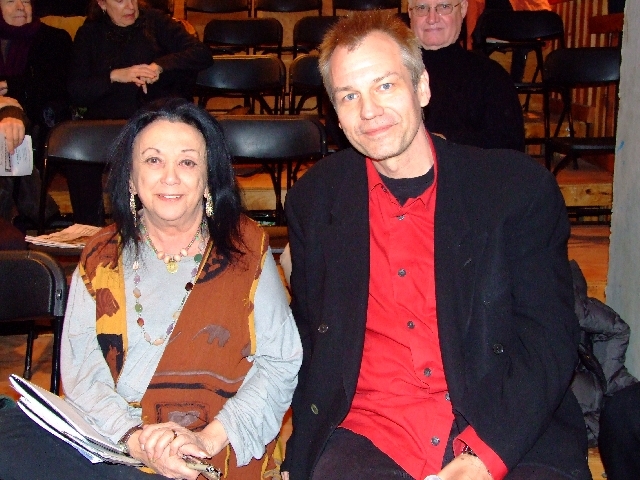 Judith Malina and Living Theatre composer Patrick Grant in 2007. The Zero Method by Hanon Reznikov (1991) based on Wittgenstein’s Tractatus Logico-Philosophicus. Peformed by Judith Malina & Hanon Reznikov. Directed by Judith Malina. Original score & live soundscapes by Patrick Grant. This entry was posted in 1 - MUSIC, 2 - MISE-EN-SCENE, 7 - MIXED MEDIA, 8 - MEMORY and tagged 1926, anarchist, died, judith malina, julian beck, living, living theatre, revolution, theater. Bookmark the permalink.